How well your brain works is impacted by how you relate to other people. In his book Buddha Brain, Rick Hanson writes about the first and second darts. The first dart is the event, the second dart is how we perceive the event. If we perceive certain people’s actions as troublesome, the pain we experience comes from the second dart, that is, our perception of their actions. According to Dan Siegel in his book Interpersonal Neurobiology, these second darts are formed from our synaptic shadows, the neural network patterns laid down throughout our life and many set before we were even conscious of any programming. But even though unconscious programming creates the way we react to the world, it does not have to be the way we always react. Siegel’s work shows that how we interact with people significantly impacts our brain health. Since how we take care of our brains as we age impacts how we age, it stands to reason that paying attention to how we are connecting with others (friends, family, co-workers, and supervisors) can also help us age in ways that bring us more long-term happiness. Improving our brain health by fostering healthy, rewarding connections with others also helps us be more effective in all areas of our lives, and it’s a crucial soft skill for project managers. I’ve assembled this mind map showing what we can do to increase our awareness of how we connect with others. This is adapted from Siegel’s work on what he labels the ‘window of tolerance’, which I’ve renamed the ‘window of awareness’. You will notice the window of awareness is in the middle, framed by the boxes ‘chaos’ and ‘rigidity’. Chaos and rigidity describe how we react to information coming in—an ongoing stream in our lives. I refer to this as the ‘what is’. 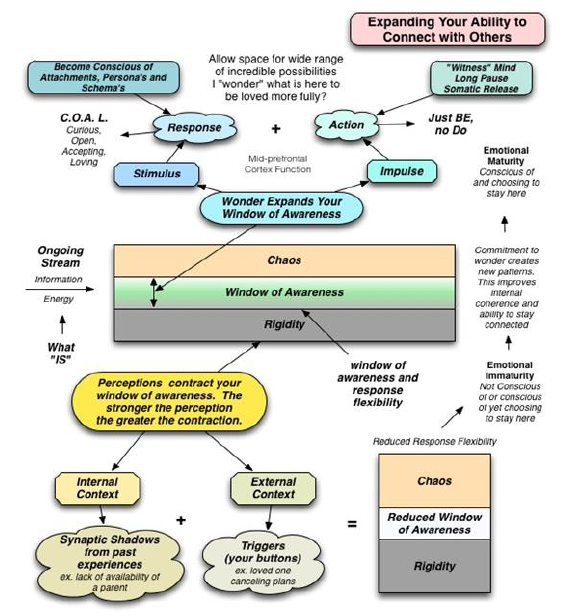 The information below the central box on chaos, window of awareness, and rigidity illustrates how we unconsciously react to this ongoing stream of information. Our perceptions are our unconscious reactions to what is. They are influenced by our internal context (our programming) and how we react externally, often referred to as our triggers or our buttons getting pushed. The less aware you are of your perceptions, the smaller your window of awareness, the fewer choices you have in how you react to the world, and the less ability you have to authentically connect with others in the moment. This becomes a BIGGER issue as we age, as we have a lifetime of programming that can make us pretty darn rigid in how we respond to the world. To improve your brain health, increase your happiness, and improve your relationships with other people as you age, align your behaviours with those in the top part of this graphic, the primary one being living in a state of wonder. Wisdom is becoming more and more conscious of how your perceptions influence the way you experience the world. Let’s consider an example from project management. You’ve joined a new project team that’s been put together to tackle a new project: building a new back-end database for your company’s online sales system. In early project initiation and planning meetings, you and the other project team members enthusiastically brainstorm a wide range of ideas. It seems that everyone has something to say, except for one co-worker. After chatting casually with this co-worker about how they’re doing, you learn that they have at least five other major projects on their plate. They don’t seem particularly excited about your new project, so they don’t want to get in the way and stall other team members’ ideas. By looking at this co-worker’s behaviour from their point of view, you widen your window of awareness. Instead of perceiving your co-worker as not caring about others’ ideas, you can appreciate their intention to allow others the opportunity to take the lead on this project. When you shift your perceptions of others’ behaviour to find the positive intent, you set yourself up to have mutually respectful, rewarding, and effective working relationships.